In September of 2012 I attended Marfa Synth Class in Marfa, Texas with Brangien. Every part of that sentence is exceptional: September (my birth month), Marfa (location, location, location), Synth Class (what’s not to like? ), Brangien (my very own Syntherella). So, it was with great excitement that upon my return to Seattle I ordered a handmade Mochika XL “Dark Side” edition analog synth from Atomosynth in Lima, Peru. The Mochika was deservedly featured and praised by Brian Lebarton at Synth Class, but synthappointment was soon to follow … the Mochika never arrived in Seattle. 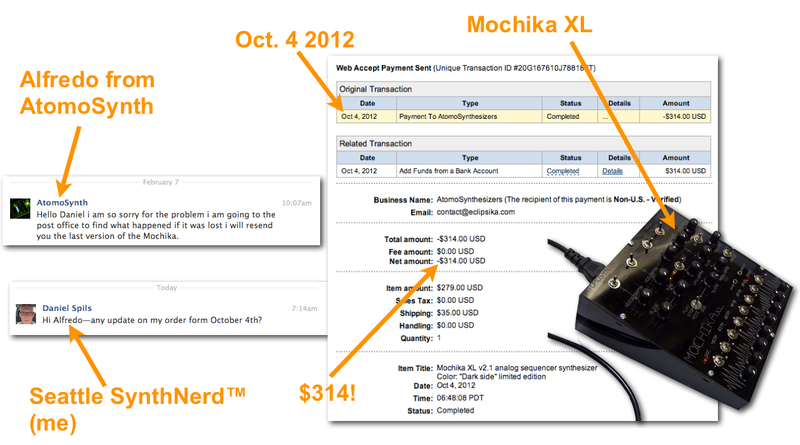 Many emails, Facebook conversations (with promises of a synth) and $314 later, I’ve yet to receive a shipping notice or even a written confirmation that the Mochika has shipped. See excerpts below. I’ll be attending the Pacific Northwest Synthfest 2013 this weekend in Seattle and, as such, felt it my synth duty to let my fellow synthesizer enthusiasts know that as tempting as an Atomosynth may be, it’s not in your best interest to order a synth from Atomosynth as it may never show up. There was nothing out-of-the-ordinary about my order (no changes, or payment issues) … it just never arrived. Alfredo at Atomosynth has acknowledged the issue, but never offered a solution.